All transactions are safe and secure with a reliable history in online purchasing behind each of our associates. Buy the Peanuts Abbey Road shirt to own Peanuts clothing and merchandise. This Peanuts t-shirt features the gang walking across Abbey Road just like The Beatles. In the design are thumb sucking Linus, counseling trickster Lucy, Charlie Brown, Snoopy and Woodstock. This group is always spending time together. Whether they are playing baseball, solving mysteries, ice skating or putting on skits, these kids are having good old fashion fun. As this Peanuts clothing item simply shows, all you need are friends, so show a friend that you care by getting them one of our Peanuts tees. Also, get a Charlie Brown Christmas tree below. 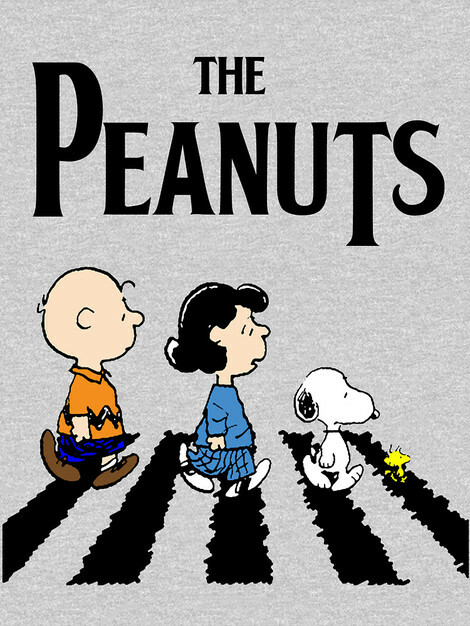 In addition to the Peanuts Abbey Road tee above, browse the Peanuts Clothing Gallery for more apparel like men's and women's clothes, kids shirts or hoodies.